Remember those movies where a genius is reading each page of a book in a few seconds? While average readers probably never get that far when they start to improve the speed in which they read text, it is certainly possible to learn how to read faster without sacrificing the meaning of the text. So called speed reading programs aid you in improving your text reading speed by gradually increasing the words per minute count in practice sessions. 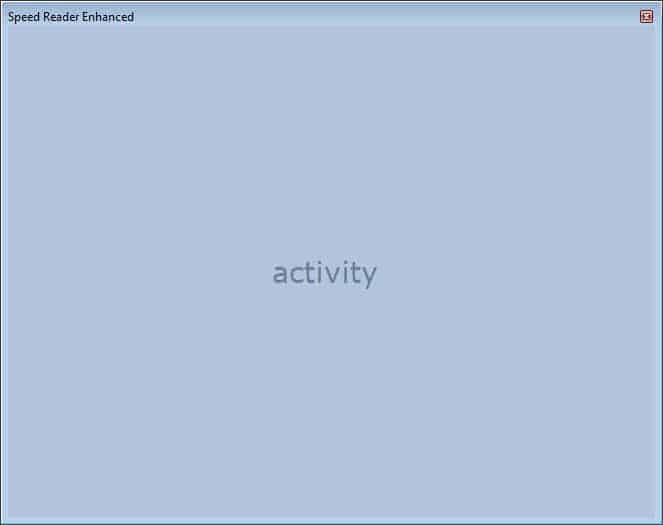 Speed Reader Enhanced is a free program for the Windows operating system that is available as a portable version or installer. When you first start the program you see a settings page where you configure the program's features. It is here that you select the words per minute and word interval as well as the text that you want to read or use for practice. The author of the application recommends that you start with a words per minute count that you feel comfortable with before you increase the count gradually over time. Depending on your reading experience, the word count of 300 per minute may be too fast to start with. I'd suggest you try it out and reduce the words per minute count if it is too fast for your. The settings page lets you change the background color and text color as well as the font the text is displayed in as well. You can furthermore change the minimum number of characters displayed to you per interval, whether you'd like the program to combine small words, and if you want the program to make small pauses after periods and commas. You can use the default text for the configuration phase, or load a pdf document or text file from the local computer system instead. A click on Show Reader opens the interface in full screen, and a tap on any key but the ESC key starts the speed reading exercise. You can hit ESC at any time to switch to windowed mode, pause with any key, and go back to the settings page with another tap on the escape key. The program saves the position whenever you pause, so that you can continue at the same position when you start again. You find a speed reading course pdf document in the program folder that explains some of the concepts and ideas behind speed reading. If you have never come into contact with the concept before, it is probably a good way to start. 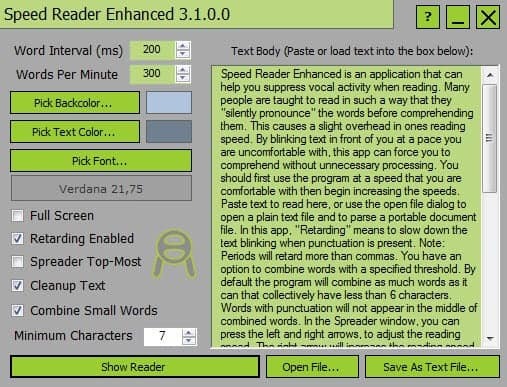 All in all a great program for Windows users who want to improve their text reading speed. Thank you for your thoughts on speed reading. What are the result of your experiments with this software? I noticed that software tools help me to increase my retention of what I read. When reading books after I trained with a software tool, I do see increased reading speed as well. Look forward to hearing from your results! The biggest issue that I see with speed reading programs is that they tend to work really well on the computer, but that you may run into issues when you try to apply that to reading a book or paper. Take this program for example: it displays one, two or maybe three words in intervals on the screen, which you can’t really when you are reading a book. That sounds really good! Did you also test your reading speed on paper? What were the results then?